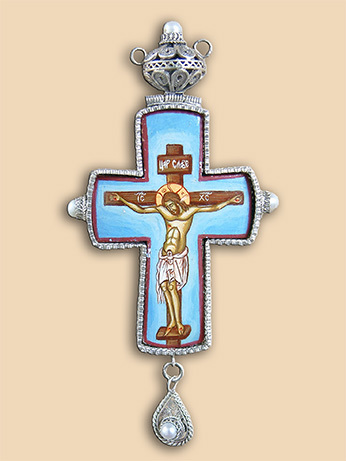 Pectoral cross in silver filigree with hand painted miniature icon of Jesus Christ with natural pearls. In pair with panagia PN012. 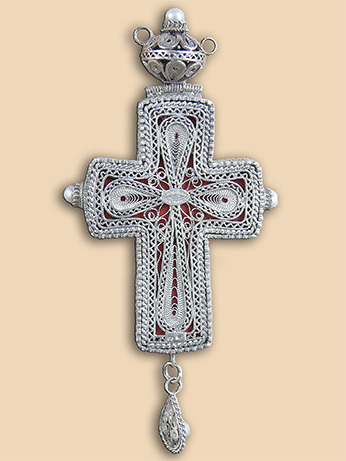 Material: silver 950, natural pearls, egg tempera. Technique: filigree, stone setting, icon painting (Sister Barbara, Petrovo Monastery near Trebinje). Size: 7,5 (12,5) cm x 6 cm. Commissioned by: Mr. Pajic Dragan, Trebinje. In possession of : His Grace Gregorios (Duric) Bishop of Zahumlje and Hertzegovina.